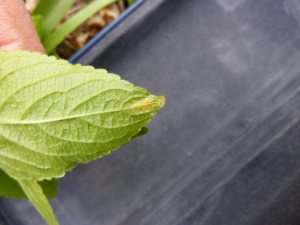 Observation - Galls on Dog's Mercury - UK and Ireland. Description: Tiny shiny galls on the underside of a leaf of Dog's Mercury. Tiny shiny galls on the underside of a leaf of Dog's Mercury.